The Vitamix- The greatest blender. We have used ours practically every day, sometimes several times per day. It is super easy to clean. We had a fantastic juicer which we stopped using as often because it was less practical to use. What we love about the Vitamix that you don’t get in a juicer is that you don’t lose the pulp. You can literally drink the entire fruit or vegetable, allowing you to get the highest nutritional value. Click on the picture below to get more information and if you choose to order, make sure you type in the following code to receive FREE SHIPPING. 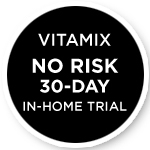 Discount Code # 06-007142 If you don’t like ordering over the Internet, you can call Vitamix Account Mgr. JP Minard and order directly from him at his direct line of 440-782- 2303 (800-848-2649 Ext 2303). The discount code if you do it that way is: 06-007142. 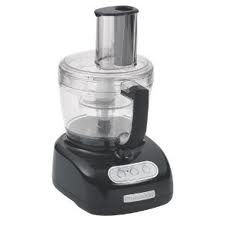 The Food Processor- We love this purchase and also use it several times per week. It can be used for date balls, cookies, muffins, cakes, guacomole etc… It is also a great chopper for salads. We also use it to make almond flour, this makes cooking without grains a whole lot easier. Titanium Frying pan- When we discovered the effects a regular non-stick pan can have on your body over time, we decided to look at other options. The aluminum often can leach into your system and lead to toxicity in the body. The other options included ceramic frying pans. We purchased many over the years and they didn’t last long and became very messy to cook with and were difficult to clean. We recently purchased a titanium pan and use it every day. We don’t have a microwave so we use it to heat up left over food. It is big enough to make a stir-fry for a big family. We have the 13″ with the cover. If you click on the picture of the pan below, it will lead you to the website where we purchased ours. It is a Canadian company so take that into consideration if you live in a different country as far as shipping is concerned. We love ours and hope you do too if you someday make the purchase. It was worth it for us because of the amount of use we get out of it. Attended the Wheat Belly workshop on Saturday. Wow it really opened up my eyes! Love the vibrant family website. So glad you enjoyed it Arlene!